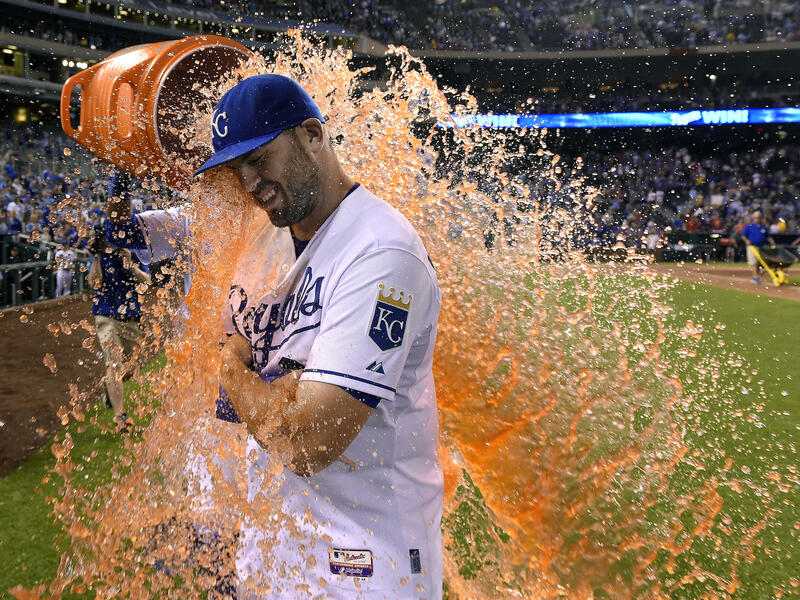 The Kansas City Royals' Mike Moustakas gets the celebration Gatorade dunking from Salvador Perez after the team's 7-4 win over the Boston Red Sox during a baseball game on June 20, 2015, at Kauffman Stadium in Kansas City, Missouri. 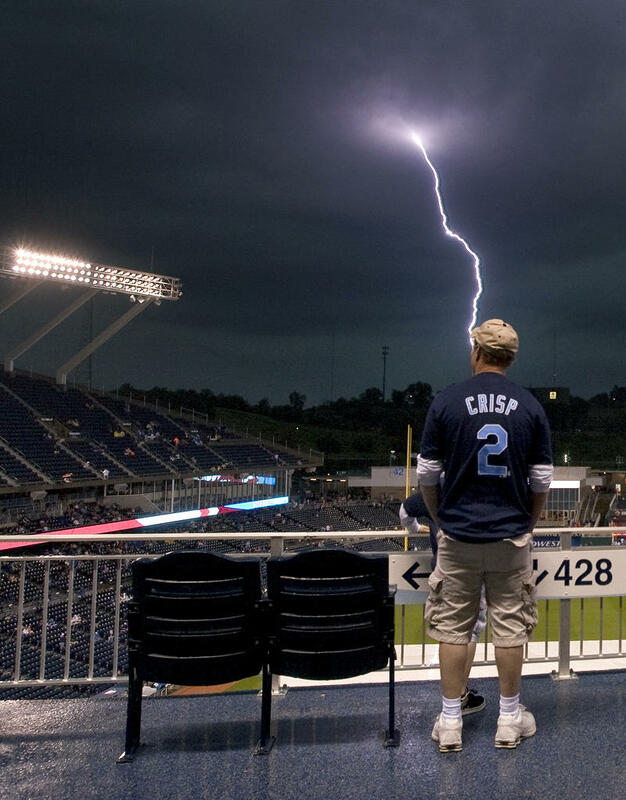 Shawn Green, of Kansas City, Missouri, waited out the rain delay in the upper deck as lightening struck outside the stadium before a May 15, 2009, baseball game between the Kansas City Royals and Baltimore Orioles at Kauffman Stadium. Oklahoma forward Blake Griffin flips over the back of Michigan guard Manny Harris during a March 21, 2009, NCAA second round basketball game between Michigan and Oklahoma at the Sprint Center in Kansas City, Missouri. 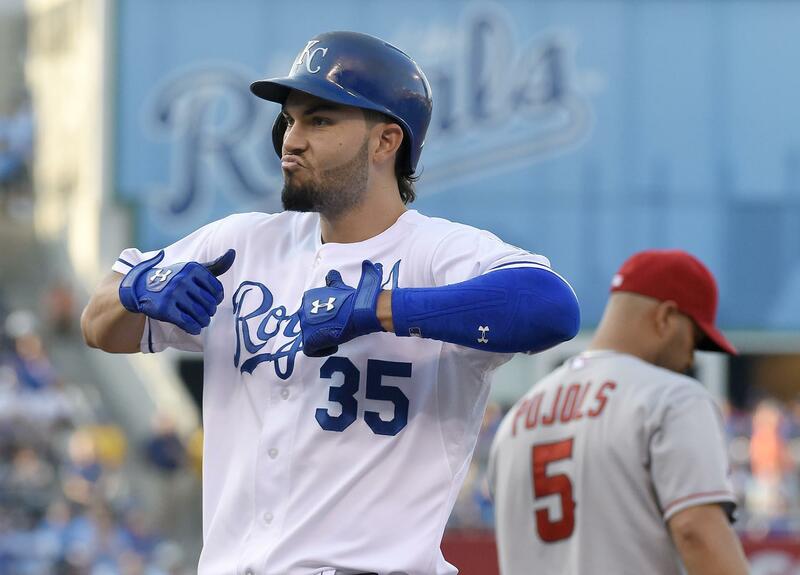 Kansas City Royals' Eric Hosmer celebrates his RBI single to score Jarrod Dyson in the second inning during an August 15, 2015, baseball game against the Los Angeles Angels at Kauffman Stadium in Kansas City, Missouri. Kansas City Royals third baseman Mike Moustakas dives into the stands to catch a foul ball hit by Baltimore Orioles center fielder Adam Jones during the sixth inning in game three of the 2014 ALCS. 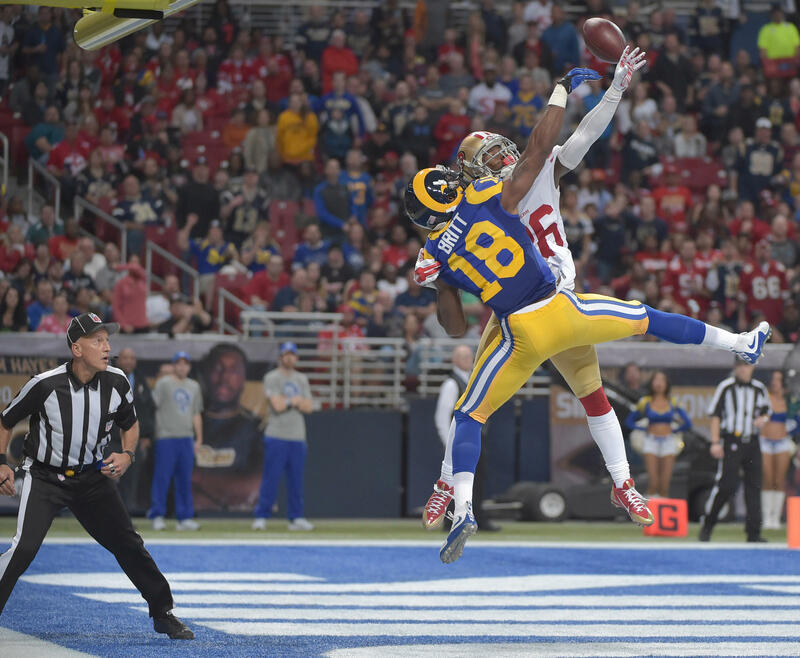 San Francisco 49ers cornerback Tramaine Brock breaks up a pass intended for St. Louis Rams wide receiver Kenny Britt during the first half of their Nov. 1, 2015, game at the Edward Jones Dome. Kansas City Royals relief pitcher Wade Davis (left) celebrates with catcher Salvador Perez (right) after defeating the Toronto Blue Jays in game six of the ALCS at Kauffman Stadium on Oct. 23, 2015. Kansas City Royals' Terrance Gore is hit by a pitch from Seattle Mariners relief pitcher Tony Zych during a September 22, 2015, game at Kauffman Stadium. Steve Kraske talks with sports photographers John Sleezer and Denny Medley. The roar of the fans, the daring runs on the field, and the click of camera shutters all go together at a major league sports event. When you're a photographer on the field, you get a different perspective of the game. Photographers and Kansas City-area residents John Sleezer of the Kansas City Star and Denny Medley of USA Today Sports told Steve Kraske on Up to Date that being in the moment is crucial — the action can be fast and furious or few and far between. "If you’re watching the game … you’re missing the shot," Medley said. "A lot of it is anticipation. You have a pretty good idea that a play is going to go one way… sometimes you guess wrong. You’ve got to continue shooting, because the next play’s right around the corner." Even after the play, it's not always clear what got captured in that millisecond. "You’re always not sure if you have it until you see it, but you think you have it," Sleezer said. Both photographers agree that if you miss the action of the moment, there's still another chance to get a great photo from how everyone else is reacting to what just happened. Sometimes, that emotion is an even bigger moment than the actual play on the field. From their places on the field, photographers are privy to a lot of the emotions happening in the Royals dugout that the fans in the stands can't see. Although they're side by side, photographers and players exist almost in two separate worlds. "You hear conversations between players in the dugout. There’s kind of that unwritten rule that there’s a wall between us and the players ... we’re both there working, essentially," Medley said. Catching that emotion in an image can often be a challenge in sports. 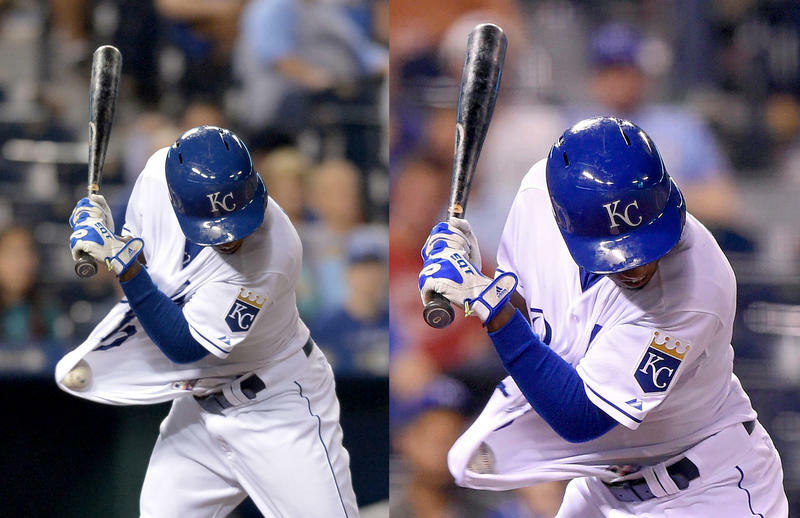 This Royals team is different, and the photographers have noticed. "This team is so exciting, so vibrant. When something happens that’s good, they are just jumping out of their shoes. When something not good happens, they are really emotionally showing it on their faces," Sleezer said. Sleezer, Medley and photographers Jamie Squire of Getty Images and David Eulitt of The Kansas City Star speak at 6:30 p.m. Nov. 17 at the Central branch of the Kansas City Public Library. Beth Lipoff is a producer for KCUR's Up To Date. Cecil the Lion’s death at the hands of a trophy hunter made headlines around the world a few months ago but that type of hunting is common in Africa. 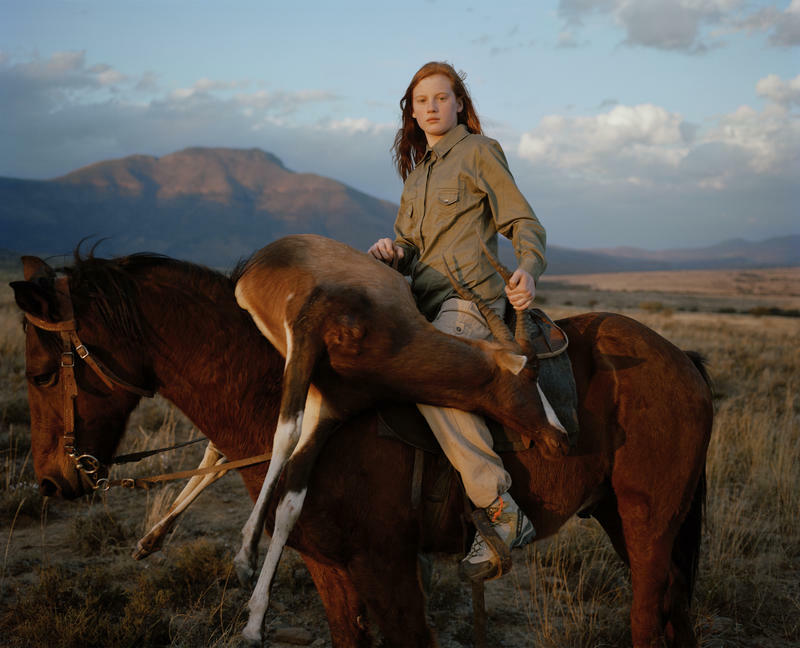 Photographer David Chancellor documented the people who participate in the sport, along with the big game targets they kill in his documentary series, Hunters. National Geographic photographer Jodi Cobb travels great distances to discover the secret realms of world culture. 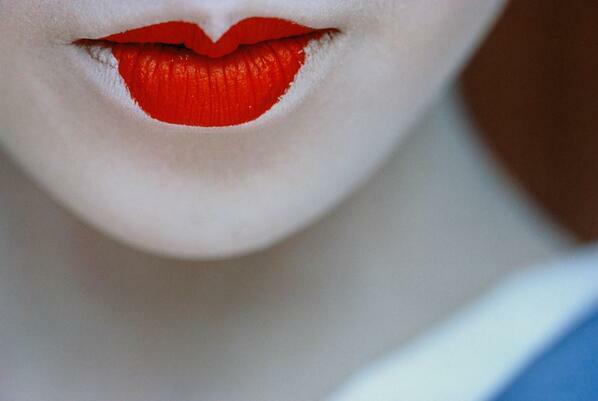 She has documented fascinating visual stories about many subjects, including the quirky nature of twins, the hidden lives of Saudi Arabian women and Japanese geishas.